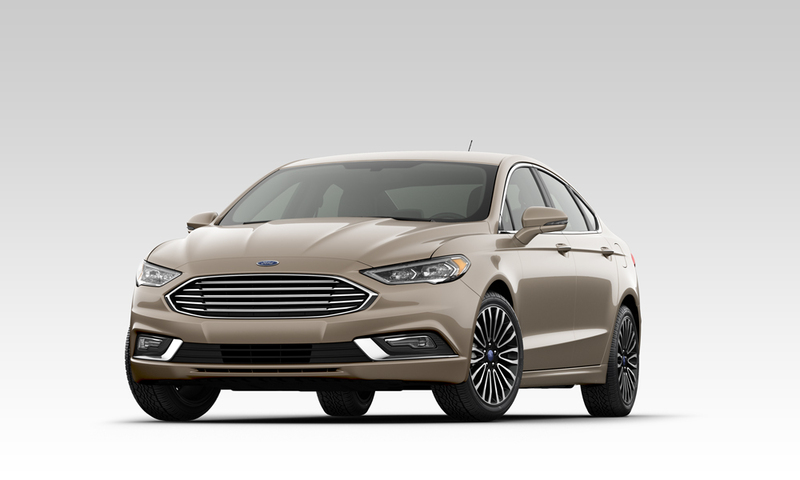 The 2019 Ford Fusion is a midsize vehicle offering lots of trunk space, comfortable seats, excellent handling and a vast array of amenities. Five trim levels are available: S, SE, SEL, Titanium and V6 Sport. It’s powered by a 2.5 liter four-cylinder engine with an output pf 175 hp paired with a six-speed automatic transmission. Three series of Ecoboost engines are available. Available engines include a 1.5 liter turbocharged four-cylinder engine with an output of 181 hp, a 2.0 liter turbo-four engine with 245 hp and a 2.7 liter twin-turbocharged V6 engine with 325 hp. The interior offers seating for five passengers and comes with cloth seats. Optional seating features include temperature and power adjustable seats. Two sets of LATCH connectors are in place. Standard features for the 2019 Ford Fusion include a stereo system with four speakers, push-button start, Ford’s MyKey and the ability to utilize voice commands. Available optional features include a premium stereo system with twelve speakers, satellite radio, a 8″ touch screen, dual-zone automatic climate control and more. The new Ford Co-Pilot 360 is standard and comes with a blind spot monitoring system, rearview camera, lane keep assist, automatic emergency braking and forward collision warning. Cargo space stands at 16 cubic feet. A split-folding rear seat makes it easier to haul irregular shaped items. View our stock of 2019 Ford Fuson in Greer, SC below. 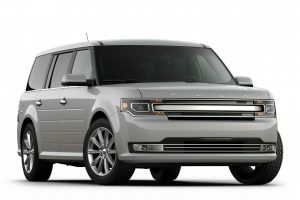 The 2019 Ford Flex is a midsize SUV offering a vast array of amenities and powerful engine options. Available trim levels include the Ford Flex SE, SEL and Limited. The interior offers seating for seven passengers. Optional seating features include leather appointed and power adjustable seats. A full set of LATCH connectors are in place. Standard features include Bluetooth connectivity, rear parking sensors, a rearview camera and Ford’s SYNC system. Optional interior features include a glass roof, two USB ports, a premium stereo system with 7 speakers. HD radio, push-button start, remote start, adaptive cruise control, rear cross traffic alert, automatic parking assist and more. Cargo space stands at 20 cubic feet behind the third row and is expandable to 83.2 cubic feet with the second and third row folded back. Available safety features include air bags, 4-wheel ABS, ESC, traction control, child safety locks and more. View our stock of 2018 Ford Flex in Greer, SC below. The 2018 Ford Escape is a compact SUV offering a stylish interior, lots of safety features and athletic handling. Available trim levels include the Ford Escape S, SE, SEL and Titanium. It’s powered by a 2.5 liter four-cylinder engine with an output of 168 hp and paired with a six-speed automatic transmission. Buyers who want more power may want to opt for the available turbocharged 1.5 liter four-cylinder engine with an output of 179 hp or the turbocharged 2.0 liter four-cylinder engine with an output of 245 hp. Front-wheel drive is standard with the option of adding in all-wheel drive. The interio r offers seating for five passengers and comes standard with cloth seats. Optional seating features temperature controlled and leather seats. Two sets of LATCH connectors are in place. Standard interior features include Ford’s SYNC system, a stereo system with 6 speakers, rearview camera and Bluetooth connectivity. Optional features include push-button start, a premium sound system, dual-zone automatic climate control, power outlet and sunroof. Cargo space stands at 68 cubic feet with the rear seats folded. The cabin also features additional storage space for small items. Available safety features include air bags, brake assist, child safety locks, traction control and ESC. View our selection of 2018 Ford Escape in Greer SC below.